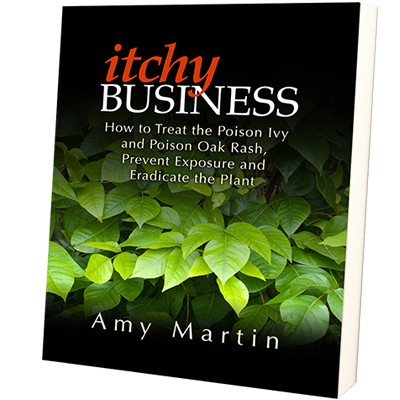 Minimize the misery of POISON OAK and IVY RASH with the Itchy Business 4-stage plan • Learn the 3 Cs of rash relief • Use minerals, herbs & more to reduce itch & inflammation • Practice safe scratch • Identify, clean off & eradicate the plant. 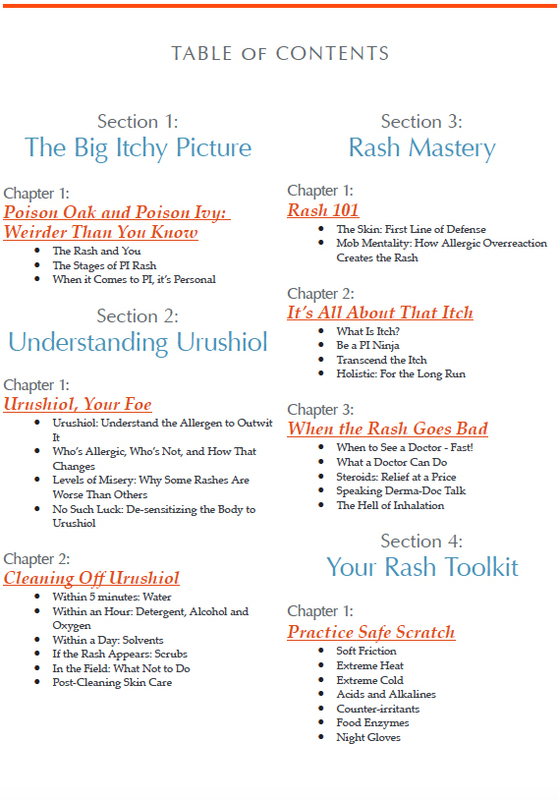 Understand the potent allergen urushiol causing the rash. Who’s allergic and how that changes. How to clean it off your skin. 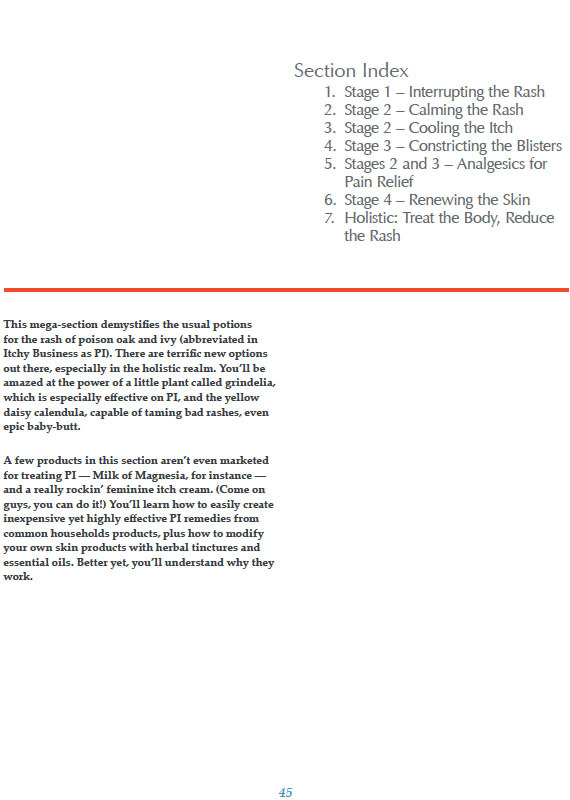 Understanding skin for rash mastery. How immune overreaction causes rash. Transcend the itch. Be a PI ninja. When to see a doctor. How to practice safe scratch. 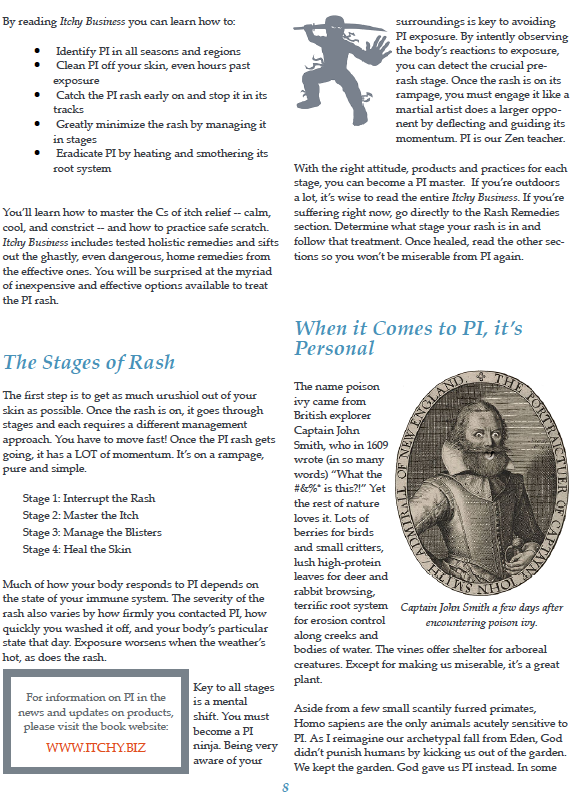 Treat the rash by its stages and succeed. 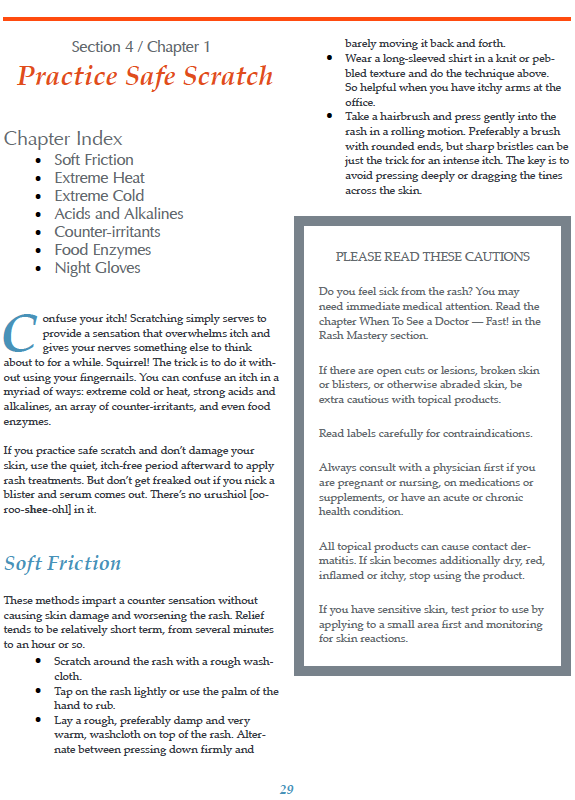 The Cs of itch relief: cool, calm, constrict. 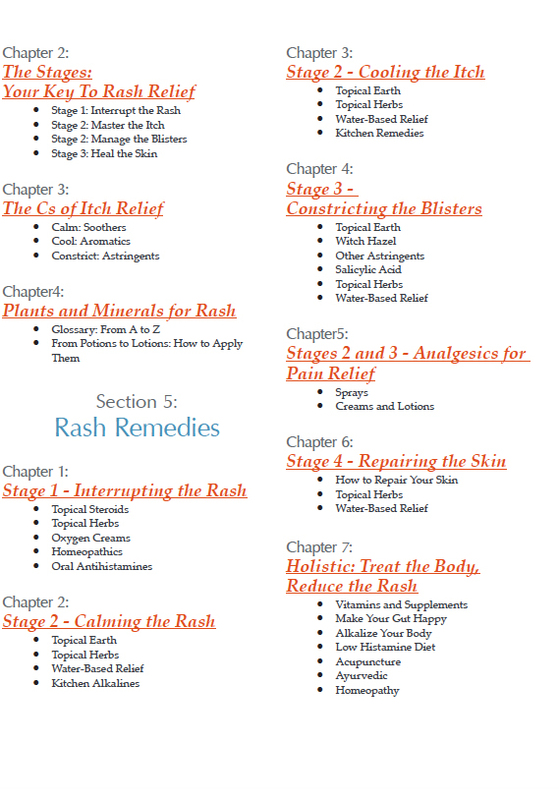 Rash remedies: holistic and conventional products for calming the rash, cooling itch, constricting blisters. Analgesics for pain relief. 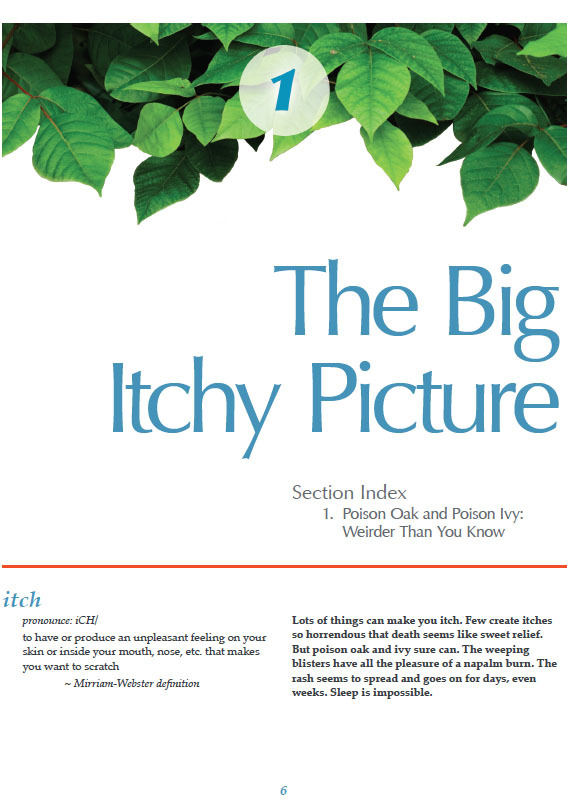 Identifying the American Axis of Itching— the four main species — in all places and seasons. Innocent imitators. Poison Sumac: the Swamp Monster. Prevent urushiol skin contact with clothes, creams and better habits. 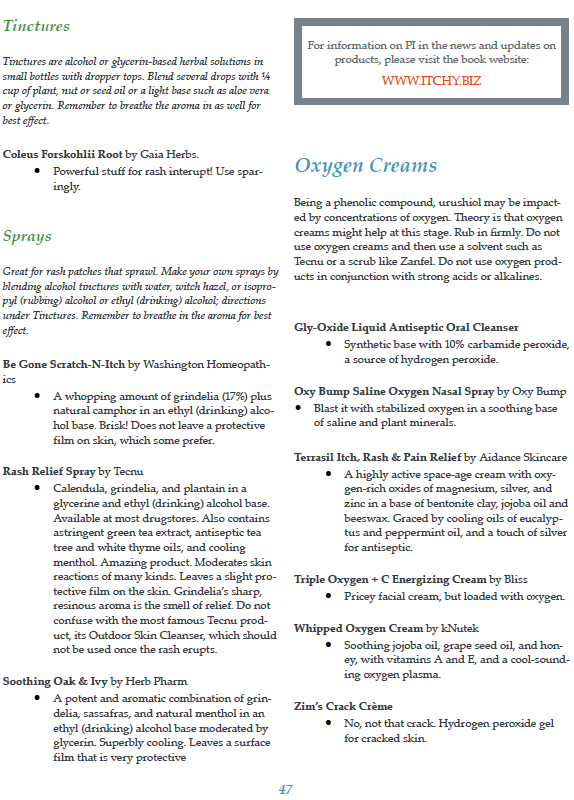 Weird ways we spread urushiol around. How to clean everything. Eradicate the plant by yanking, spraying and mulching it. Timeline for waging battle. Combat gear and nuclear-level protection. Urushiol mummies. Poison ivy tree lacquer. Poison oak art. Pop culture poison ivy. 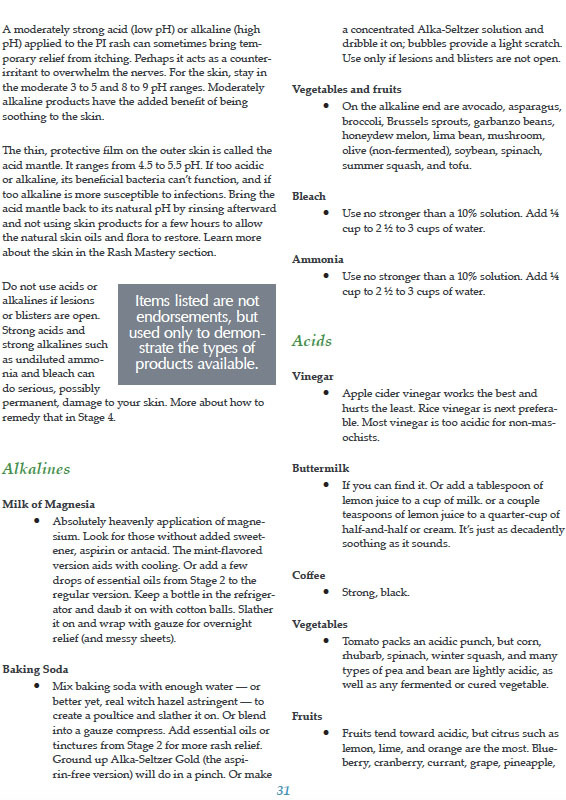 Deadly home remedies. Debunking the myths. Save money! Reduce worker comp — this book keeps your workers out of the doctor’s office. Reduce worker misery — get them relief and back on the job quickly. Teach workers how to identify and eradicate it. Do you lead groups into parks and forests? 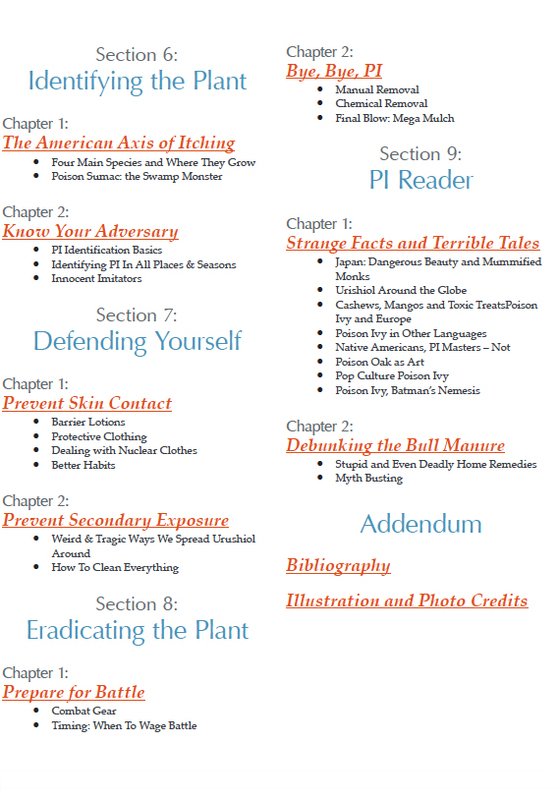 Protect your charges by learning how to identify all species of the plant and anticipate where it will grow to. 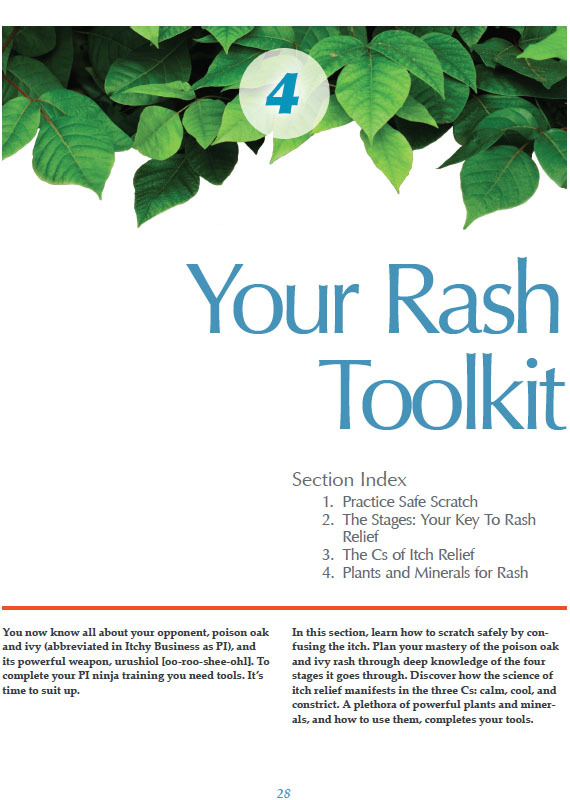 Discover effective protection techniques and how to treat rashes that occur. 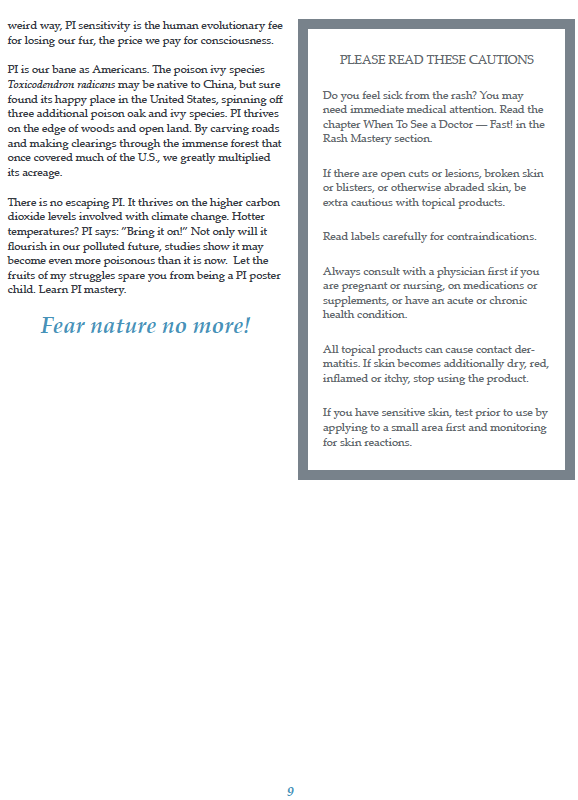 Enjoy nature without fear of rashes with the right barrier lotions and clothes. Learn to identify the plant in all circumstances. Use the right products and heal from rashes quicker. 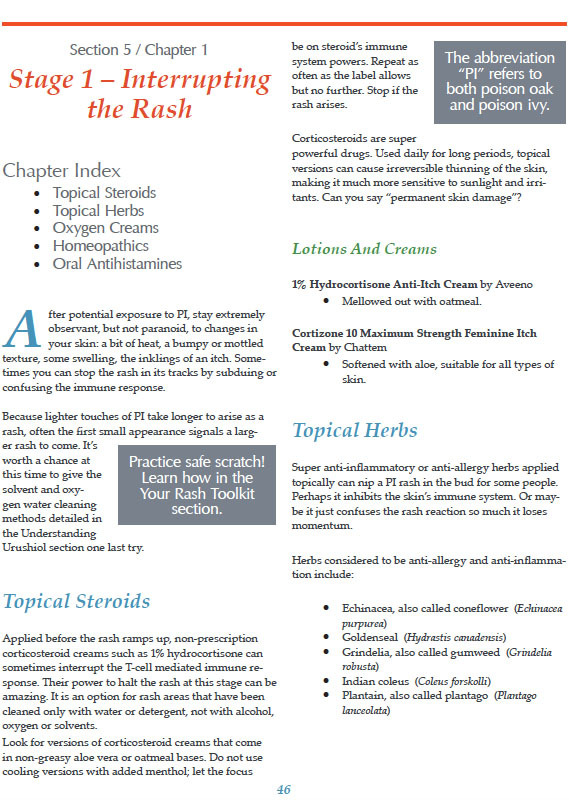 Give your patients options to steroid creams, ineffective antihistamines and analgesics that can be misused. Help them find safe ways to scratch and heal their skin. Do you organize volunteers in improving parks and wild place? Make sure their experience in nature is a positive one so they continue to protect it. You work hard enough outdoors. 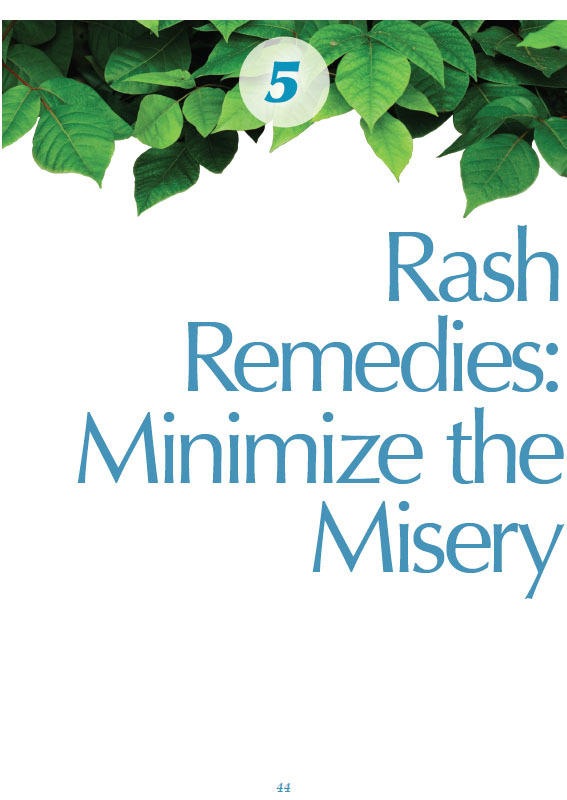 Getting a painful rash is more than you should have to bear. 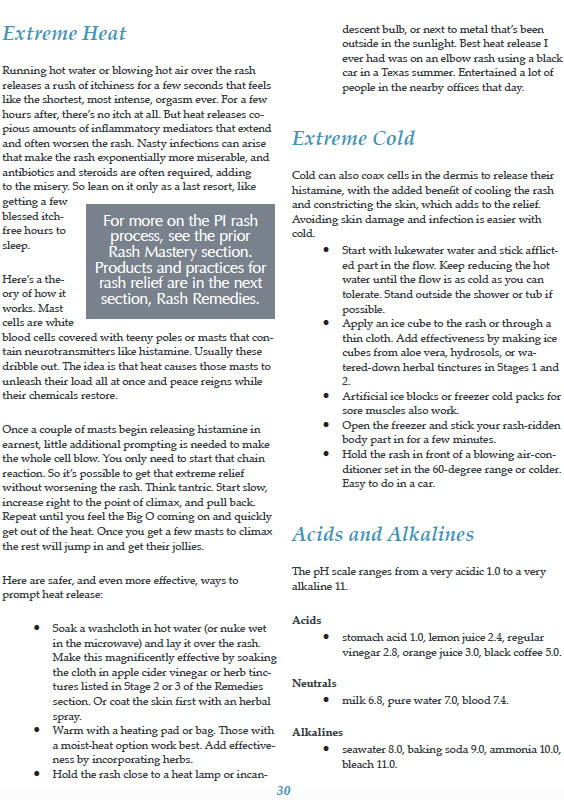 Learn to stop the rash in its tracks and get to the root of the problem — inflammation. Full Color! Enjoy Kindle Features! 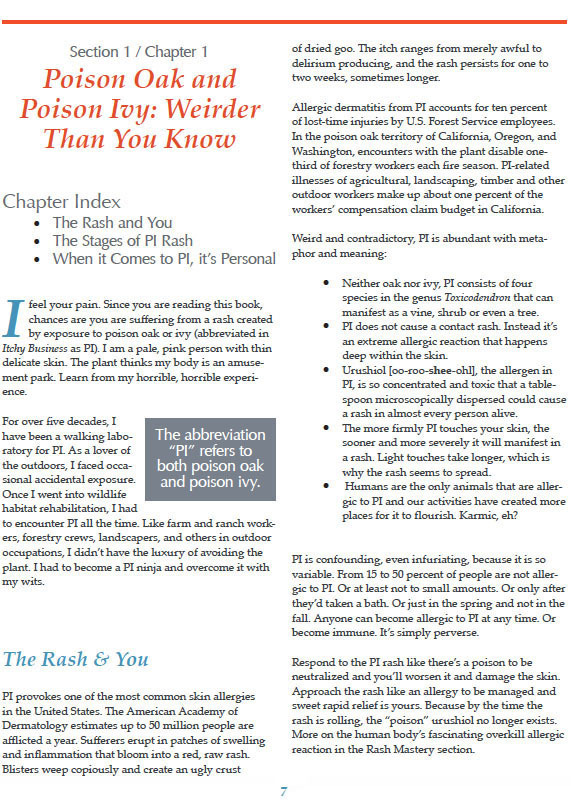 You can continue the conversation HERE in the blog that contains updates to information in the book.